East Side Collection Chunky Ribbed Sweaters with Leopard Trim for the Ultimate in Style and Warmth. A great way to keep dogs warm, comfortable and looking chic on cold weather walks. East Side Collection Chunky Ribbed Sweaters with Leopard Trim for the Ultimate in Style and Warmth. 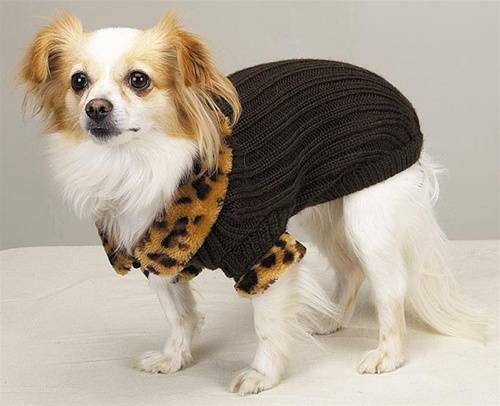 A great way to keep dogs warm, comfortable and looking chic on cold weather walks. These stylish sweaters come in a soft, chunky rib acrylic knit that is machine washable for easy care. Faux leopard print fur trim at neck and cuffs adds a fashionable look. Button closures at neck and rear leg loops provide a secure fit. Care Instructions: Machine wash on gentle cycle in cold water; line dry.